What are your thoughts on the recent PageRank update? Google’s head of Google webspam, Matt Cutts (a Google employee and guru on everything search) is always telling webmasters not to obsess too much about PageRank. I would agree, it is not always that accurate, (give or take 1 rank either way) probably because it is not publicly updated that frequently – it is always updating, results are just not released regularly to the public. At the end of the day, PageRank is just a lovely green (or maybe a not so lovely white) bar that a page is given. It doesn’t necessarily correlate to how a site is performing in the SERPs, and doesn’t guarantee good rankings. That is a direct quote from Google. So basically, pages ranked 0/1 (in Google’s view) aren’t that special, there are loads out there, nothing makes them stand out. Pages with a PageRank 2 are more important, they are special, but not that special. The further up the scale you go, the more value your page is worth. You might have a high value homepage, but low internal pages, that is to be expected, as a lot of the algorithm is based on links. One would assume that if you have serious traffic, you should be right at the top of the PageRank scale, as people find your page very useful, and therefore Google must think your page is important. Until very recently, Google.com has been a PageRank 10. It is the most visited site on the internet, by a long way. From what I understand, the site receives around 1,050,000,000 (1.05 billion) unique visitors a year. Facebook is second, with around 950,000,000 (0.95 billion) unique visitors a year – note not all those people have accounts. Twitter gets just 220,000,000 visitors a year (0.22 billion). So why is it then that in the recent PageRank update, Google ranked its main homepage (Google.com) 9/10, it ranked Facebook 9/10, but it ranked Twitter 10/10. Twitter is one of around 10 sites on the net with a PageRank 10. Twitter is only the 8th most globally visited site on the web, whereas giants Google and Facebook are clear leaders. The UN and the The U.S. Government’s Official Web Portal are two of the other few sites with a PageRank 10 on the web. Updates over the last year have seen a lot of PageRank 10’s loose their rankings. Why? 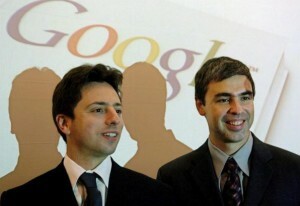 Larry Page and Sergey Brin - the founders of Google. Is the web getting less ‘important’? What are your thoughts on this? I find it really interesting how Larry Page‘s (co-founder of Google) algorithm, which is used by Google, ranks Google less than top. I think it is a great thing, a move in the right direction, particularly after the penguin episode that to be honest I do not fully understand. I wonder if this is because PageRank looks at inbound link structure. Maybe Twitter gets more credible inbound links than Facebook or Google. Most Twitter profiles and statuses are public, and we can easily link to them, but many Facebook updates and profiles are locked up behind privacy rules, and most bloggers have little need to link in to the pages they access on Google. Could be Tammi, very good suggestion! What about Google though? Why have some of its sites dropped in PR? My guess is that they decreased the value of inbound links from certain sites, and some of those sites were linking into Google. For example, if Google tweaked its algorithm to penalize sites with a lot of inbound links from SEO companies, that would affect its site as well because a lot of SEO companies link to pages on Google. In fact, it is possible that Google.com has more inbound links from SEO companies than any other site on the web does.